Central Fire Station on Hill Street, was built in 1908 and is still in use today. 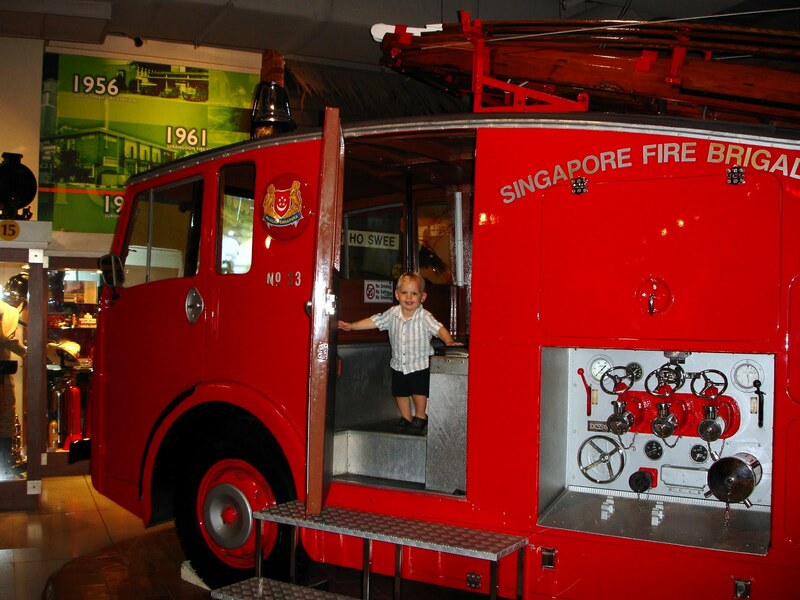 The oldest existing Fire Station in Singapore has an Open House every Saturday from 9am-11am! The kids can climb in and see a real life firetruck. Then, head through to the Civil Defense Heritage Gallery, where the retired trucks are on display. We will be back for the open house, but today's trip we were only able to explore the Heritage Gallery ~ it isn't Saturday. Both kids loved the fire trucks and the firemen in uniform! The bloody arm from the trapped victim is a bit much, but I'm sure they have their reasons. Sadly, I am losing my knowledge of the proper English spelling living here and just had to refer to Webster for the correct spelling of Defense to uncloud my mind from the above picture. Singapore follows the English English (or should I say England English), that's why it's Defence instead of Defense.